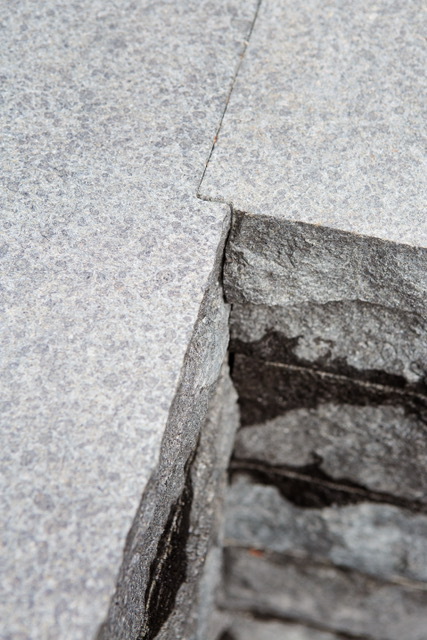 MODERN STONECRAFT is an innovation that combines the ancient Dry Stone building method and Lifting technology to meet the demands of modern design. So much of modern design is about dimensional and rectilinear shapes whether on a 2D plane or in a 3d space, the flat or the vertical as well as large scale and big size. Hence, the understandable propensity for architects, designers and builders to use concrete. But what if you could have all of these modern design characteristics and use natural stone with large scale, big size and something else extraordinary like surface texture? For my latest project in Truckee, California I worked with my team of collaborators and our stone importer to develop a new approach THat used the magic of the Dry Stone method along with installation technology such as vacuum lifters and friction grabbers to set over 270 tons of stone into place. 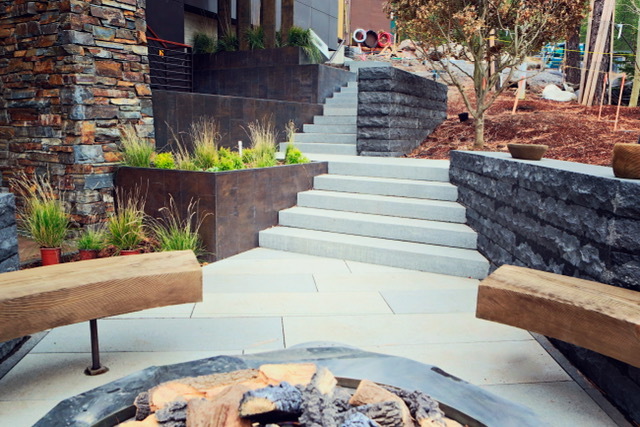 The goal of scale was achieved by using monolithic pieces of Granite risers and landings and basalt wall stone that ranged from 800 to 3,000 poundS. Furthermore, I had 3 textures (adze, flamed and Lychee) applied rotationally to every exposed surface to "awaken the stone's potential". FOR SOME STUNNING EFFECTS WE "KEYED" WALL CORNERS AND "EXTRUDED" RISERS FROM WALL FACES. As a FINAl DETAIL WE HID A NUMBER OF THE LIGHT FIXTURES INSIDE HOLES WE DRILLED INTO THE WALL.